Although I had the same canvass bag and walking boots, which it seemed foolish not to bring, I knew this would be a very different journey. 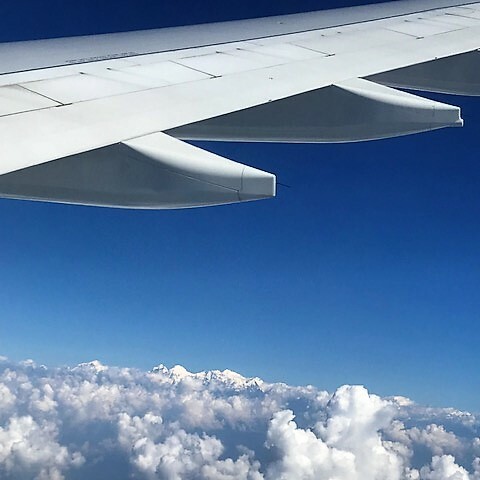 As the plane commenced its descent into Kathmandu, I caught a glimpse of snow covered peaks set against the backdrop of a clear blue sky and marvelled once more at the apparent solidity of the ever changing cloud formations. 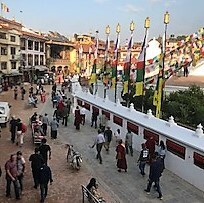 My last visit here was as a trek doctor accompanying college students on their trip of a lifetime to Everest Base Camp. A couple of years later I started attending the meditation classes at Kagyu Ling, first met Lama Jampa and set off on the dharma path. 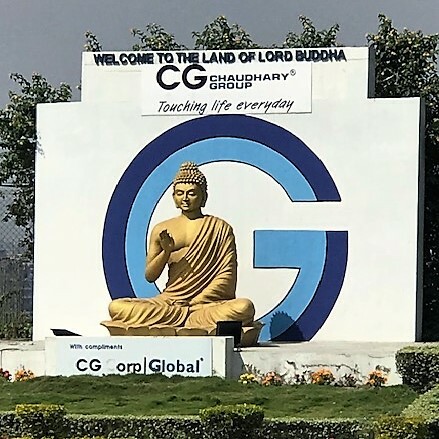 So here I am returning to this ancient Himalayan Kingdom where many great Lamas have passed through, centuries ago, on perilous journeys to receive the dharma teachings from India and take them to Tibet. It was thanks to great masters such as Guru Rinpoche and Marpa that the dharma flourished in Tibet. 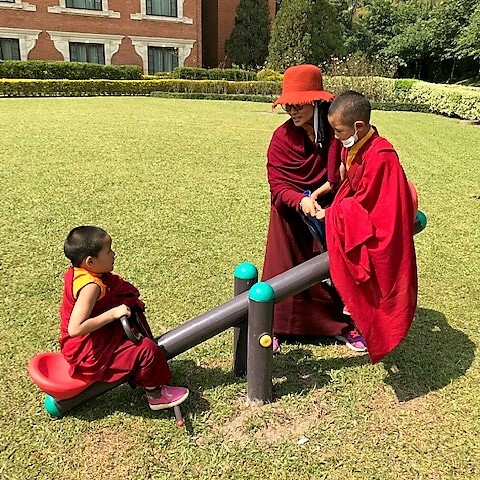 Karma Thinley Rinpoche is one of Lama Jampa’s main teachers and I will be visiting Tegchen Legshay Ling, the nunnery he established in Boudhanath thirty years ago. The Great Stupa in Boudanath is the centre of much activity. 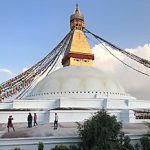 Representing Buddha’s perfectly enlightened mind, a stupa is always regarded with great reverence but The Great Stupa is something special and this is apparent from the great faith it inspires in those who come to see it. From dawn to dusk, hundreds of faithful Buddhists of all generations and cultures perform circumambulations in a clockwise direction, known as Kora. Many elderly Tibetans and Nepalis can be seen with their malas doing circumambulations and reciting prayers. By doing this in the vicinity of the Great Stupa, they are generating much merit. Early in the morning, many people use the boards provided to do prostrations and practice. It gets very busy in this area on the raised part of the stupa so if there are no boards then people sit on the stone floor. According to the Legend of the Great Stupa, a poultry woman made an aspiration to build a Great Stupa that would contain the relics of the Buddhas and be a field of merit for all beings. 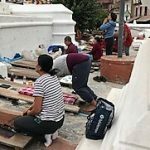 Following the recent earthquake in 2015, there was some damage to the structure of the Stupa and during the repairs, many iron boxes were taken out from within the Stupa. More gold was added to the pinnacle of the Stupa which now shines with brilliance in the sunlight. 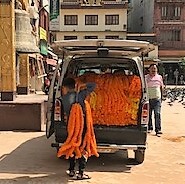 Today the Stupa was decked with garlands of marigolds. It has been hard to resist taking many photos of this wonderful Stupa! This is the nunnery which was set up by Karma Thinley Rinpoche, a Buddhist meditation master and one of Lama Jampa’s main teachers. There are about twenty nuns of ages ranging from 7 upwards, including some older nuns and a few monks as well. Apart from prayers and regular pujas, they also have lessons during the week to develop their education. 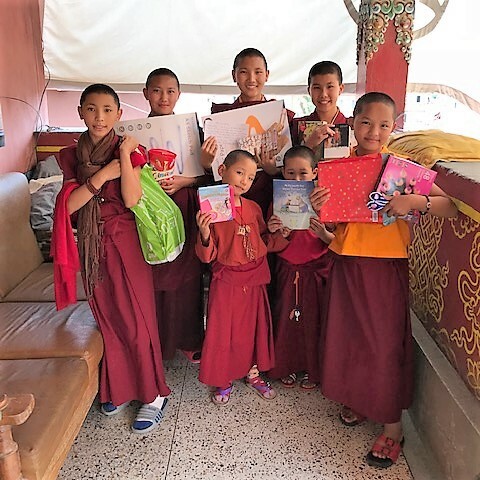 One of the nuns loves books so they were very happy with the chocolates, books and DVDs donated by members of Kagyu Ling for the Saturday afternoon film which they look forward to. Yesterday everyone was invited to have lunch at a local hotel which was a lovely occasion, sponsored by Norman, a long time Canadian student of Rinpoche’s. After the lunch, there was a beautiful moment when some of the younger nuns brought back some beautifully scented frangipani flowers which they offered to Rinpoche much to his delight. Afterwards the little nuns thoroughly enjoyed playing on the swings and seesaw. 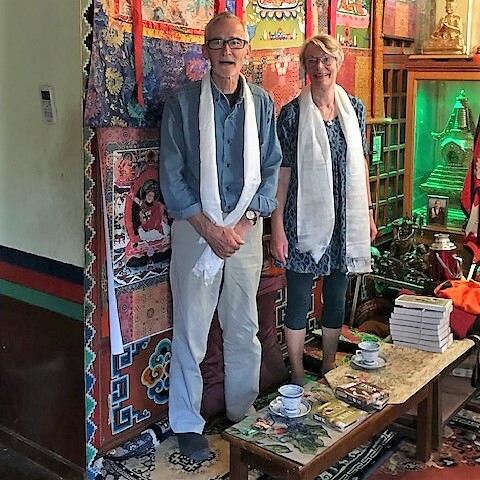 Today Meg and Kit from our community in Devon arrived to see Rinpoche, armed with some wonderful knitted hats which had been given to them by a member of the Thinley Richen Ling community in Bristol. 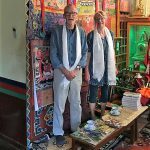 I was keen to visit Pusupatinath, mainly as my friend Kunga had mentioned that there was a cave where Naropa had meditated. 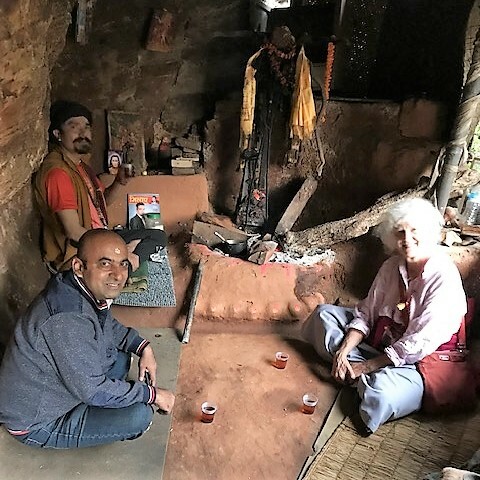 I had no idea where to find it but as Kirsty, who was also visiting Karma Thinley Rinpoche, had previously been a Hindu and was fluent in Nepali, I was confident that I was with the right person to find the cave. 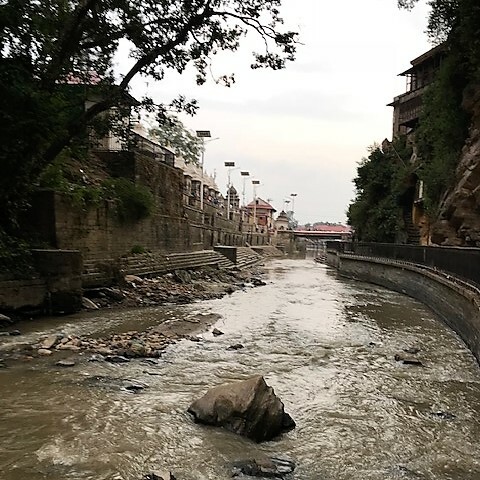 Pusupatinath is where dead bodies are cremated down by the river and is a holy site for Hindus. After a few false starts, we met a Nepali man who was very helpful after we repeated ‘ Naropa caves’ a few times and he decided to help us on our somewhat unusual quest. There was some discussion with various people about directions, all in Nepali so I could only guess at what was going on, but ‘Goofah’ means ‘cave’ and featured frequently in the conversation! 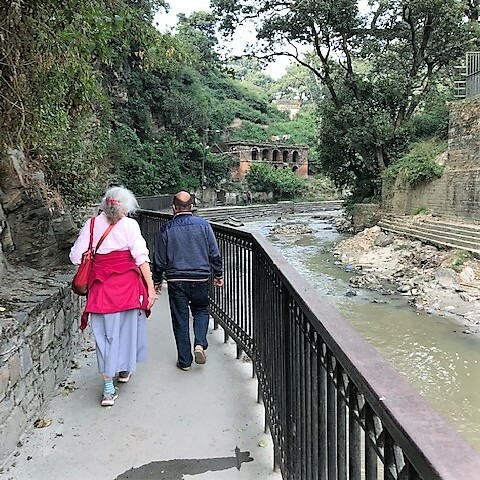 He managed to convince the official to waive the usual tourist entry fee, given that we had not come to visit the Hindu temples that are usually the main focus of interest for visitors, and we were led down the river away from the main area towards the hills. 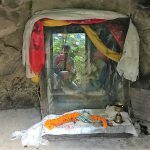 After a short climb we came upon two caves next to each other where the great Indian siddhas Naropa and Tilopa appear to have meditated. It was Marpa who made three perilous journeys from Tibet to India to receive the Kagyu teachings from his great teacher Naropa, that have been transmitted down the centuries to the present day. 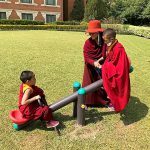 These are the very same teachings that Karma Thinley Rinpoche has transmitted to Lama Jampa Thaye who has given them to us, so this was amazing to see. I stepped inside the small cave, not tall enough to stand up in, and sat down to meditate. 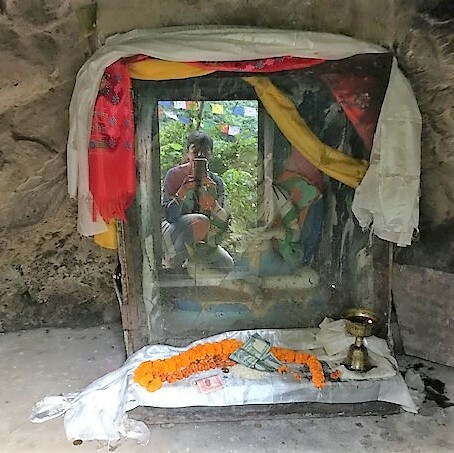 Somewhat to my surprise our Nepali guide also sat down close behind me and began chanting a Hindu mantra at the same time at which point I realised meditation was going to be somewhat challenging. 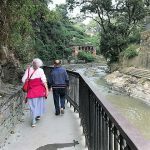 There was a strange and somewhat unexpected harmony between Buddhist and Hindu mantras being recited simultaneously but is a good reflection of the ease in which these two religions seem to coexist here in Nepal. I came out of the cave to find Kirsty and our new friend talking with a Hindu sadhu, who it turned out lived in the cave above. Clambering up the rocks without footwear which had to be left below, we soon found ourselves sitting in his cave whilst he heated up a pan of boiling water to offer us a cup of black sweet tea! It was a surreal moment to say the least! It turned out to be quite an adventurous afternoon but it seemed that all our karma had come together for that brief time. I was happy to have found the caves of such great Indian meditation masters and holders of the Kagyu lineage. Walking back along the Ghats we passed a body just about to be cremated, reminding us of the fragility and impermanence of life.